West Ham manager Alan Pardew has apologised to Arsene Wenger following their touchline row after the Hammers hit a dramatic winner at Upton Park. Arsenal boss Wenger appeared to take offence at Pardew's enthusiastic celebrations after Marlon Harewood's late goal clinched a 1-0 victory. Wenger also refused to shake hands with Pardew at the end of the game. 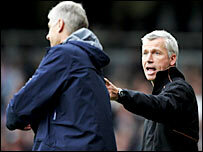 Pardew said: "I apologise if I offended Arsene. It was nothing personal, I was celebrating the goal." He added: "It was shame because it was a tense game and we were under lot of pressure. I was celebrating the goal, that was all basically. "Arsene seemed to have a problem with that, probably rightly. It was frustration, there was nothing personal. Arsene is a top guy and I really respect him. I thought I was entitled to celebrate the goal after a pulsating game. "Nothing was said. Maybe he was angry at a couple of decisions and it was a physical game. We wanted to upset Arsenal, we wanted to win. "But I was celebrating our goal, nothing more, and I apologise to him again and to Arsenal." "He is a top guy and I really respect him. I thought I was entitled to celebrate the goal after a pulsating game." Pardew said he hoped to get the chance to make up with Wenger. "I want to sort things out," said Pardew. "It's not right for the image of the game. "Emotions were high but there was nothing dangerous or horrible. That is what happens with last-minute goals." Pardew's bust-up with Wenger is unlikely to be the only incident featuring in referee Rob Styles' report following the ill-tempered game at Upton Park. Arsenal striker Robin van Persie appeared to be struck by a coin thrown from the West Ham section of the crowd in the 38th minute. A policeman picked up a coin from the pitch but the Dutchman was able to continue after a couple of minutes of treatment.